I love abalone shell. It makes an appearance in my bone sets several times. In my main set I use two pieces like this to represent the people in a relationship. I carry extra pieces of this type for situations that have more than two parties. I have long pieces, short pieces, light pieces, dark pieces. The key is to get pieces that are easily distinguished from each other. These small pieces came from a local shop and cost less than a dollar each. 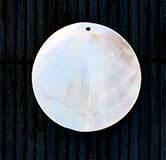 I have a piece to represent the full moon. And I bought this piece to represent the new moon, though I ended up using something else for that purpose. I wrote a blog entry about my plans for one of these pieces, but any of them could be used for the same purpose. I bought the large shell at the top* when I bought my bones to use as a bone throwing tool. I put the bones in the shell and tossed them from it in the same way I currently use my basket, but my set quickly grew too large for it. It now serves as an incense burner. A quick search on eBay will turn up all sorts of wonders that can be used in your bone set. 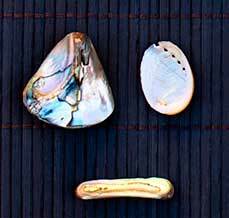 Abalone jewelry is inexpensive and you can get pendants and charms in a wide variety of animal shapes and symbols. 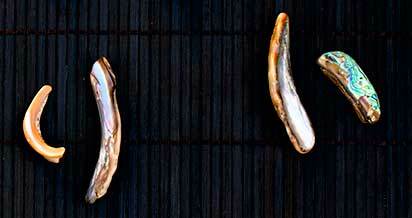 Abalone is pleasing to the eye and it adds a touch of flash and beauty to your bone set. 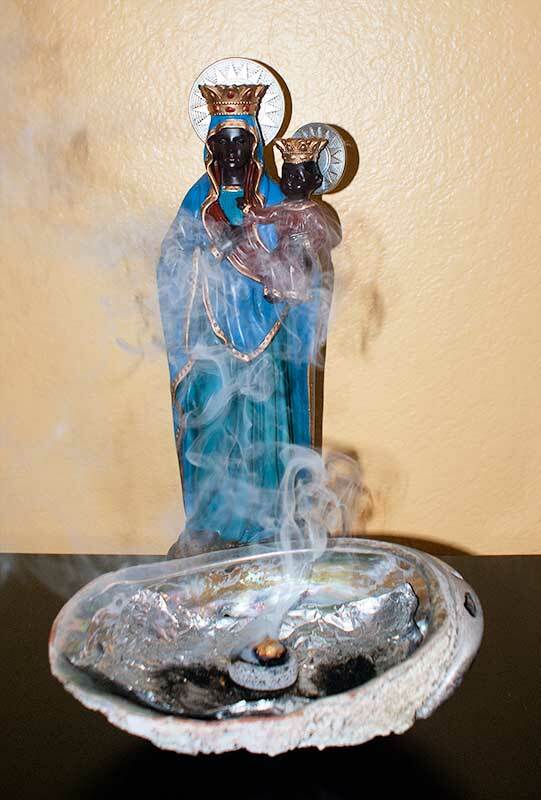 *The statue is from Legba’s Crossroads.